Tiviski is a well-known and respected dairy factory, based in Nouakchott, Mauritania, that processes camel milk into modern, high quality products. In their Mauritanian factory various camel milks, camel butter and also camel cheese are produced. 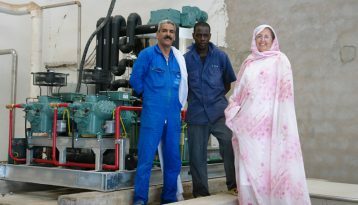 Tiviski was looking for a solution to rapidly cool their camel milk and having realized several other projects in Mauritania, Recom Ice Systems was selected to supply a 10 tons ice machine.